Summary: Matilda is a genius. Unfortunately, her family treats her like a dolt. Her crooked car-salesman father and loud, bingo-obsessed mother think Matilda's only talent is as a scapegoat for everything that goes wrong in their miserable lives. But it's not long before the sweet and sensitive child decides to fight back. Faced with practical jokes of sheer brilliance, her parents don't stand a chance. Matilda is turning 25 this year! Kind of unbelievable, right? How can it already be 25 years since this wonderfully witty, intelligent five-year-old sprang onto the literary scene, inspiring all of us to read more and fight the man with our powers of telekinesis (Er, or just wish we had powers of telekinesis)? We’re celebrating this milestone with an epic 25-stop blog tour! Follow along to find out how your favorite bloggers feel about Matilda, and for a chance to win a Matilda prize pack at each and every stop! I'm a little embarrassed to say that I never read MATILDA with either of my children, but when I learned that MATILDA is 25 years old, I figured it was high time to remedy that. Booking Daughter informed me that she read is when she was a kid, and everyone has read it. Obviously, everyone but me! So just this week I sat down and dug into MATILDA. I will soon be sharing my views on this delightful (and classic) children's book. ‘Am I really?’ Matilda asked. ‘I suppose you’re right.’ Matilda said. Miss Honey marveled at the child’s lack of conceit and self-consciousness. Even if the rest of us never achieve telekinesis, books can give everyone a kind of superpower. Every Thursday, bloggers participating in the Matilda 25th Anniversary tour will write about what kind of superpower they’ve gained from reading. Here's my question: Matilda has superpowers that allow her to move objects with her mind. We can’t all be that lucky, but I think we all gain superpowers through reading, like an Anti-cynicism superpower or the superpower to put yourself in someone else’s shoes. What superpower have you gained through reading? Did Matilda help you find that superpower? 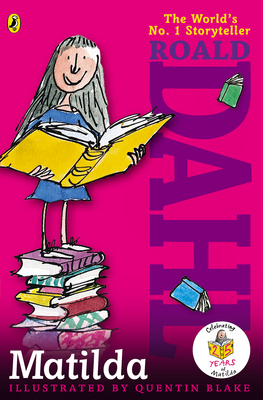 What I do have in common with Matilda, though, is a passion for books and reading. The superpower that I've gained through reading isn't an obvious one, but it has made a big difference in my life. By reading all types of books for over 40 years, namely ones that center around other cultures, I've learned to have more compassion and empathy towards those less fortunate than I am. In addition, I have also learned to be more grateful for the blessings in my life! Feel free to add your own superpower in the comments! Roald Dahl (1916-1990) was born in Llandaff, South Wales, and went to Repton School in England. His parents were Norwegian, so holidays were spent in Norway. As he explains in Boy, he turned down the idea of university in favor of a job that would take him to "a wonderful faraway place.” In 1933 he joined the Shell Company, which sent him to Mombasa in East Africa. When World War II began in 1939 he became a fighter pilot and in 1942 was made assistant air attaché in Washington, where he started to write short stories. His first major success as a writer for children was in 1964. Thereafter his children's books brought him increasing popularity, and when he died children mourned the world over. Matilda was published just two years before he died. Quentin Blake, the first Children's Laureate of the United Kingdom, has illustrated most of Roald Dahl's children's books. Be sure to visit the Official Matilda Facebook page to keep up with all things Matilda! For the next stop on the Matilda 25th Anniversary blog tour, head to I Am a Reader, Not a Writer tomorrow! Giveaway alert: Did you know Matilda is now a Tony Award-nominated Broadway Musical? The show opened in April and has already been nominated for 12 Tony Awards, including Best Musical! Since not everyone can go to New York City to see the show in person, Penguin Teen is bringing the show to you with a Matilda the Musical prize pack giveaway! Enter to win a copy of the Matilda the Musical soundtrack, a Matilda the Musical poster, and a paperback copy of Matilda by Roald Dahl! To enter, just fill out the form below before June 5th at 11:59 p.m ET. I will randomly select and notify the winner the following day. This contest is open to those of you with U.S. addresses only. Good luck! I, too, have gained compassion and empathy through reading. I've also learned to question things. I'm not sure if I've read Matilda or not so I entered your great giveaway! Wonderful giveaway! I wouldn't mind some superpowers! I love Matilda! Thanks for the giveaway! What a fantastic giveaway! I haven't read Matilda and I think I'd love to know her.